Kurt Baldwin is Associate Professor of Music at the University of Missouri, St. Louis, where the Arianna String Quartet has been in residence since 2000. 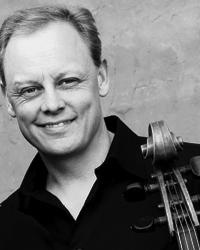 As a founding member of the Arianna String Quartet in 1992, Mr. Baldwin has been awarded the Grand Prizes at the Fischoff Competition, Coleman Competition, and Carmel Competition, and was a Laureate at the 1999 Bordeaux International String Quartet Competition. Mr. Baldwin has concertized throughout the United States, Canada, Mexico, Italy, France and Japan, has been heard in live radio broadcasts in over 30 states and on NPR’s “Performance Today,” and has recorded for the Albany, Centaur, and Urtext classical labels. He has collaborated with members of the Tokyo, Cleveland, Juilliard, and Vermeer quartets, as well as Richard Stoltzman, Bernard Greenhouse, Gilbert Kalish, and James Campbell. He studied with Janina Ehrlich at Augustana College, received his bachelor of music degree from the San Francisco Conservatory with Irene Sharp, and earned a master of music degree from the New England Conservatory, where he was a student of Bernard Greenhouse. Mr. Baldwin also holds a Performer’s Certificate from Northern Illinois University, where he studied with Marc Johnson and the Vermeer Quartet.